As a roleplayer, I’m always on the look out for games that I might get to play. Sometimes it’s because of the rule systems, sometimes it is because of the setting, and sometimes it’s just something that catches your eye. You know those games. The ones where you end up reading the sourcebooks cover to cover. You let your mind take it all in long before you ever break out a character sheet. Kickstarter campaign ends on Monday, August 21, 2017, at 9:00 AM EDT. “1879 is FASA’s steamweird roleplaying game, that takes the place of Shadowrun in our cosmology. Due to a weird science experiment that opens a stable wormhole, Earth’s magic cycle gets jumpstarted in the late Victorian era, leading to a Gilded Age with elves, dwarves, snarks, and trolls. As the world adjusts to its new races, technological progress races forward, as the Age of Steam begins to give way to the Age of Electricity. Clockwork computers exchange data over telegraph wires, steam-powered airships chug through the sky, and industrial applications of magic churn out new wonders daily. In the new world, the British army faces off against the Samsut, descendants of the Babylonians and Akkadians with their own Weird Science that allows them to raise the dead and use zombies as shock troops and skeletons as fire and forget munitions. The Saurids, the true native race of the Grosvenor World, aren’t happy about either Terrestrial civilization, and may yet manage to unite their fragmented tribes and create a second front. Play it as steampunk corporate espionage if you like, or court intrigue, or lost world pulp adventure – yes, there are dinosaurs! 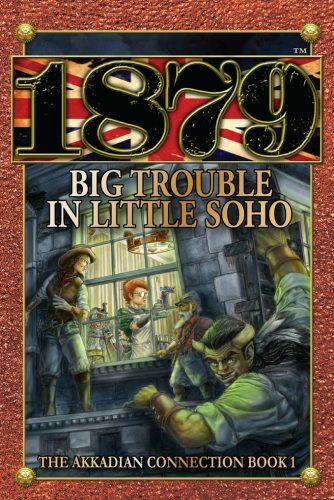 This particular Kickstarter is actually for Book 1 in The Akkadian Trilogy (Big Trouble in Little Soho) and/or the London Gazetteer (London, or The Haunted City). In addition, at a couple of the higher Reward levels, you can get both of those as well as the Players Guide, the GM’s Guide, and the GM Screen ($138 and up). London, or The Haunted City is the breakdown of the city of London within the game. From the breakdown, it details the every piece of the city, with potential adventure hooks when the PCs decide they want to just wander around (as PCs always seem to do). Then there is a breakdown on the technology, the politics, and even the various criminals and activities they might… entice your players with. 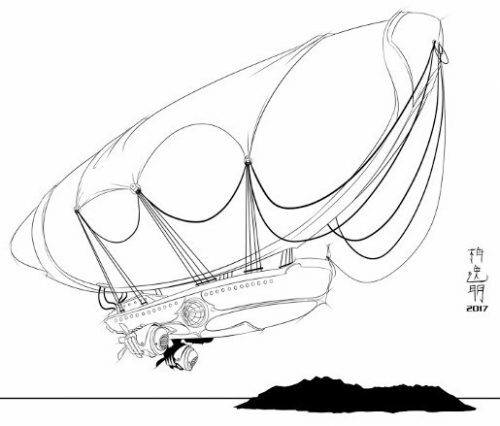 Since Steampunk kind of occupies this odd space where everything is potentially available to you within a band of a few decades (late 1800s…-ish), sometimes that isn’t enough to entice potential players. They are looking for something a little more than just (forgive me)… gears and corsets. They need a unique Divergent Point. They need to know why your world is more appealing than the next. “The Silver Exhibition, London, 1876. Twenty-five years after the Crystal Palace Exhibition, another is held to showcase the technological wonders of Britain. An ambitious inventor shows off his device to view great distances, but something goes wrong and the machine explodes and vanishes. In its place is left a circular field of … something. So it is with great curiosity that in the 1879 setting we’re dealing with a pair of worlds… seemingly leaking into each other. Our world is on its way to steam power and technology booms while the world on the other side of the wormhole is one where more fantastic creatures and magic are accepted as the norm. A place where our world is the invaders but also potentially the saviors. I love the idea that an adventure could start on our world and end up on the other side of the portal (or vice versa). That maybe things which work a certain way here might be upside down over there. And the character roleplaying potential is there, cooked in the bones of this world(s). Do you want to play the fish out of water? Not a problem since probably half the time you’re not going to be on your home world. Want to learn magic? Want to see the wonders of this new technology? All of it is available to you. Just pass through the Rabbit Hole. 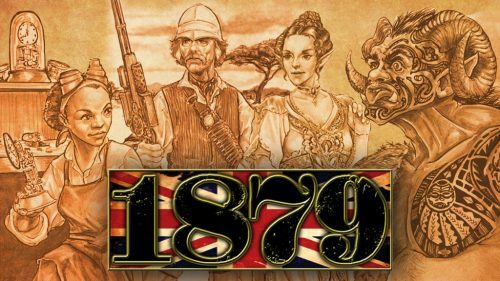 For more information about 1879 and other FASA Games, check out their website here. Tagged 1879, FASA Games, John McGuire, Kickstarter, RPG, Steampunk, Steampunk Fridays.